The Instant Pot is all the rage for busy home cooks! 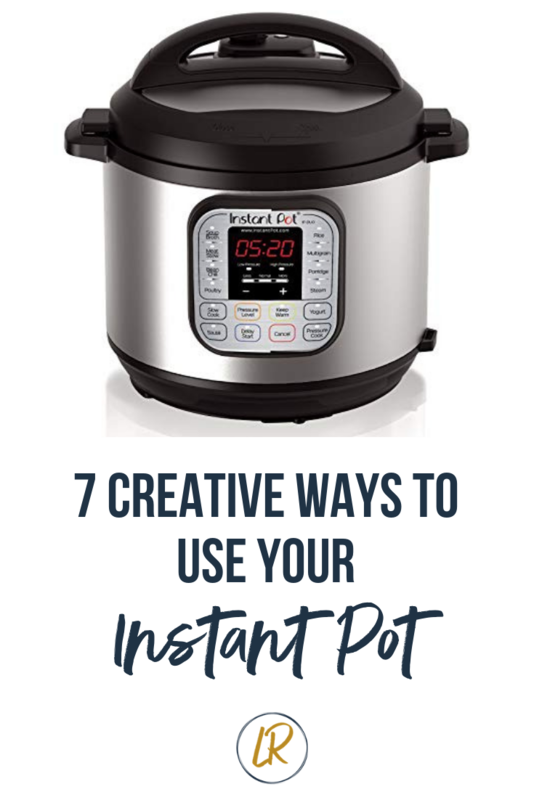 Today I’m sharing 7 creative ways to use your instant pot beyond the usual soups, meats, beans and grains. Also just a heads-up that there are affiliate links in this post meaning, at no cost to you, I will earn a small commission if you click through and make a purchase. Thanks for reading! What’s the Deal with the Instant Pot? I think it’s pretty well established that the Instant Pot has turned into somewhat of a cultural phenomenon in the last few years. Even if you don’t own one, most of us can attest to their insane (seemingly overnight?) popularity. The sheer volume of recipes on Pinterest is crazy. Every time I search for something, I swear an IP variation pops up too! I love the instant pot for simple and fast weeknight cooking with minimal cleanup (i.e. one pot meals). For example, you can throw in frozen chicken breast, a couple of cans of tomatoes, beans and broth plus seasonings and vegetables of choice and make a solid soup in less than 30 minutes. The saute feature allows you to get your onions and garlic started before dumping everything else in without having to dirty another pan, which is pretty cool too. I’ve mentioned this before, but the IP also makes cooking for a crowd a breeze because you can perfectly cook large cuts of protein in a fraction of the time that you can in the oven or crock pot. I’m talking shredded, fall apart style Korean Beef or Carnitas as the perfect centerpiece for a BYO taco bar. If you follow a plant-based diet, there are plenty of options for you too! A friend of mine recently recommended this Thai & Butternut Curry and it was another winner. Additionally you can use it for large batch dried beans which is great because honestly, I never think about soaking and prepping them in advance so I much prefer making them in an hour, pressure cooker style. When I was writing this post, I remembered that I actually made an Instant Pot video tutorial last year for a cooking challenge that I facilitated. Check it out below if you’re interested in a more visual explanation of how the IP works or feel intimidated by all of the settings and buttons - I cooked a small batch of brown rice in this one. All of the examples I mentioned above are pretty mainstream uses for the Instant Pot but did you know there’s a ton of creative, more non-traditional ways to use it too? I wanted to round up seven creative recipes (that I’ve found) to use the Instant Pot to share just how versatile it is. Many of these I’ve tried, some not. Hopefully this list gives you some new ideas and inspiration! These have become somewhat of a weekly staple in my house. I prefer my eggs on the jammy side, so I follow the 4-minute version and they turn out perfect every time and are SO easy to peel. Let me tell you, hard-boiled eggs were always so frustrating for me until I discovered this method. I’m not sure it was the altitude or what, but every time I made them on the stove they would be either impossible to peel, overcooked or a combination of the two. This method is quick and hands-off! This French toast casserole recipe involves placing an oven-safe bowl on the trivet inside of the Instant Pot so that steam can cook it on all sides - genius! Just to clarify, the trivet is a small metal insert that’s included in the box for when you need to lift ingredients off the bottom of the pot. I love this dish for brunch entertaining because it’s unique, but simple to throw together and really delicious. It’s a crowd-pleaser! I have to admit that I haven’t ventured into the yogurt-making setting yet but this coconut milk version is really intriguing! There’s a yogurt button to make the whole process faster and smoother than trying to figure it out on your own. This specific recipe is great for anyone who needs to/chooses to avoid dairy (plus less expensive than buying from the store). Baked sweet potatoes are a great staple to batch cook and keep handy for quick lunches and dinners throughout the week. You can stuff them with all of your favorite fillings (actually, here’s three ideas!) for a super satisfying 15-minute meal or mash the inside for a side dish. Using the instant pot cuts down the cook time by about half and frees up your oven for other items, which is especially helpful if you’re making these as part of your weekend meal prep routine. 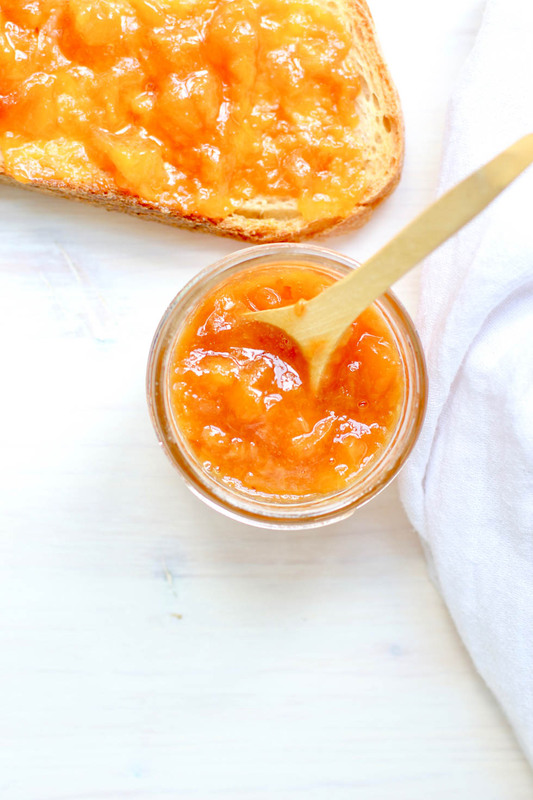 This simple jam recipe will definitely happen in my house once peaches come back into season later in the summer. In the meantime I may even try it with frozen peaches to see if it works since those are always available. I’m always looking for new ways to incorporate Colorado peaches into just about everything (I’m kind of obsessed actually) and this comes together in just 20 minutes! In addition to spreading on toast, I can see this being a great way to add flavor to grilled fish and chicken. And how amazing is that color? HELLO. Did you know that not only can you cook an entire chicken in the IP, but you can then take it one step further and turn it into a delicious pho? This was actually one of the first recipes I attempted when I bought mine (ambitious? yes.) and it turned out great, although it’s definitely on the more time-intensive side than the others on this list. Compared to traditional, “simmer on the stove all day” pho it is faster. Just note that the total time listed is 1.5 hours because you first have to cook and shred the chicken, then do a second cook. Last but certainly not least, I am really excited about this raisin bread by Kara aka the Foodie Dietitian! While this raisin bread doesn’t use the Instant Pot for the actual cooking process (you’ll need the oven for that part), it creatively utilizes the yogurt function for the rise which is so clever and something I would never think to do. I’ve not tested this yet, but it’s on my list because it looks insanely delicious with butter slathered on top and there isn’t any kneading required, which cuts down on a step and saves time. Shortcut homemade bread? I’m in. Which Instant Pot Model Should I Buy? Now if you don’t currently own an Instant Pot and are interested in purchasing one, this is the one I have and love. It’s a good size and has all of the features I’ve needed at a really affordable price point. I’m not sure if it’s temporary, but the price is actually significantly lower now than it was when I bought it. Many people don’t realize, but this is actually a 7-in-1 appliance so in addition to the pressure cooker setting, it can also be used to cook a variety of ingredients with several different methods. If you do end up purchasing it, I hope you love it as much as I do!